Hermano Lobo is a multicultural music group with both British and “Navarro” members who have two things in common: their love for music and their residence in Navarre. The members of the group, Paul Bentham, Mikel Rodríguez , Al Macaulay, Bob Adamson, Inés Rubio and Jon Herbert, have come together to write a new chapter in the history of the Pamplona music scene. All have belonged to different groups in the past and are now sharing their previous musical experience to create a new style that blends folk, pop, country and swing together, as well as performing rock and “western” movie soundtracks. Hermano Lobo returns to pure sounds to create a musical style that can be understood and loved by all. The band works towards a global style, forgetting individualisms and achieving a harmonic atmosphere full of musical nuances. Don´t miss their next concerts! Can you think of a more pleasant way to spend a Friday evening, enjoying a glass of Navarre´s finest wines in a place like the citadel? Summer is almost here and to celebrate it we recommend a night of wine, pinchos and excellent music. The stars of the night -white, rosé and red- are going to be out on the Fifth Annual Wine Night organised by the Wine Origin Guarantee Control Board on Friday, 22 June, 21:00 at the “Cuidadela”, in Pamplona. But the wines will not be alone. Pinchos, music and gifts will make this evening complete. An excellent plan for the shortest night of the year! Music will include the live performance of Marlango´s latest album, the first project in Spanish recorded by the band which is led by the actress Leonor Watling. As well as DJ Funk Fatale´s show, you´ll be able to see live creations by four avant-garde artists who propose to combine wine with contemporary art in a cultural context. Doors open at 20.30 and for just 20 euros you will be able to taste four different wines and four pinchos as well as enjoy the shows and participate in the raffles. Is there a better way to start the summer? 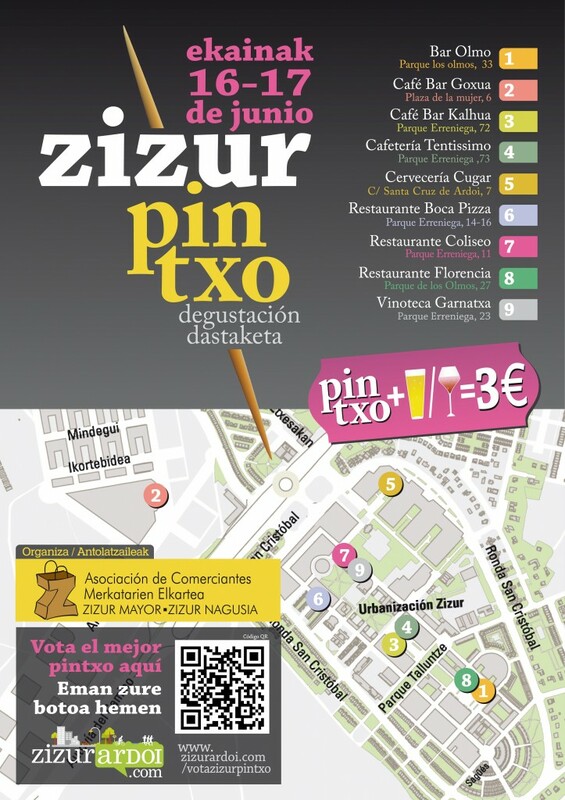 Vote for the best "ZizurPintxo"
The Business Association of Zizur Mayor has organised a tasty activity for this weekend! Come round to Zizur and enjoy! Whoever thought that Navarre needed a beach to be able to compete in beauty with our neighbours in Gipuzkoa is going to be happy! Spend a splendid day at the beach with “traineras” (traditionally, sardine fishing boats) included. For the first time in Navarre, you´ll have the opportunity to attend a real “trainera” regatta. This sport, which was invented by those men who fished for sardines in the Bay of Biscay (Cantabrian Sea) , starts its season in the Alloz Reservoir, next to the Aritzaleku camping site. The exhibition race will count with the participation of male teams from Orio, Trintxerpe, Hondarribia, Sanpedro, Zarautz, La Donostiarra, Pasai Donibane and Zumaia. We should also note that there will be a female race in which four boats will participate, though they are still to be confirmed. The regatta will be held in two rounds with a racing area of 1,500m. Now that it is almost summer and the heat is starting to be felt, it´s a great opportunity to spend a different type of day. Don´t miss this chance to enjoy a unique show in Navarre. Also, a great atmosphere will be assured. We expect the arrival of numerous fans of the crews participating, as well as other visitors and people who have never seen this type of event before. Don´t forget to bring your sunscreen, your towel and a sun lounger and spend a day at the beach. Just like being at the “Concha”, oye!! Well, if Little Miss Muffet had been born in the valley of Ultzama, then she would certainly have been eating a “cuajada”, which is a typical dessert made from sheep´s milk curd. If you´ve never tried it, you can´t miss the third annual “Day of the Cuajada” which will take place in the village of Auza, Ultzama. On Sunday, 10 June and during the whole morning, you will be able to see how the dessert is made; from the milking of the sheep to the traditional cooking method used to made the final product. On Saturday, various companies which produce this dessert will open their doors to the public and show their installations and the way the product is produced on a wider scale. There will also be exhibitions of regional dances and old-fashioned farm work. And if that isn´t enough to make your day enjoyable, visit the beautiful surrounding areas of Ultzama like Aralar and Leizaran! On Sunday, June 3rd, the streets of Pamplona will make room for thousands of bike-riders on a 15K route in and around the city. The annual cycling event, in its seventeenth edition, expects to have over three thousand participants sign up. To be able to participate, cyclists must sign up from May 29th until June 2nd. This can be done at “El Corte Inglés” or at the stands that will be installed in “Plaza del Castillo” and the entrance of the University of Navarre Clinic, in Pio XII Ave. The inscription will have a cost of two euros and part of the proceeds will be donated to the NGO Vicente Ferrer Foundation. It´s a great opportunity for you and your family to take to the streets of Pamplona without worrying about the traffic. You´ll be helping a good cause, getting some exercise and most importantly, having a great Sunday bike ride! Although we have seen enough water these days in the form of rain and hail to keep us happy for a while, there are other forms of water that are at their peak. Weather permitting, this weekend visit the different cascades that are at their most beautiful moment now in spring. As spring comes to an end, the cascades become connected to eachother. When winter snows thaw, the warmer days cause the cascades and rivers to overflow on their long awaited journey to the sea. Don´t miss out on this opportunity to listen to their roaring sound and watch as the water races uncontrollably. We suggest visiting any of the cascades that can be accessed easily by people of all ages. Pay special attention to the sounds of birds chirping as they try to attract their partners as it is now mating season for many species. Xorroxin Cascade in Erratzu: it´s path is well-marked and the hike can be appropriate for any age. Well, it´s not like visiting the Niagara Falls but the cascades in Navarre do have their own charm. Can you imagine coming upon this typically medieval sight? A military camp, knights practising combat techniques with their swords, blacksmiths working the iron, a tavern, falconry and artisans showing off their crafts and a real castle!! Where could this take place? In the Castle of Javier on Saturday, May 19. The Medieval Festival will not only include thematic expositions and shows, children´s games and horse rides, but you will also be able to sign up for a free guided tour to discover the inside of the fortress. You´ll be treated like the lord or lady of the land or feud, in this case. While in the area, why not take this opportunity to visit surrounding places of interest like the Leyre Monastery or the Gorge in Lumbier. You´ll love it!